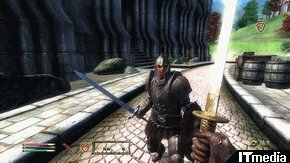 The Elder Scrolls IV: Oblivion (C)2006 Bethesda Softworks LLC, a ZeniMAX Media company. The Elder Scrolls, Oblivion, Bethesda Game Studios, Bethesda Softworks, Zenimax and related logos are registered trademarks or trademarks of Zenimax Media Inc. Marketed and Distributed in Japan by SPIKE.